The last time “06880” checked in with Charles Adler, the 1992 Staples High School grad was a co-founder of Kickstarter. Since 2009, 6.4 million users have used the online platform to pledge over $2 billion, funding more than 75,000 creative projects in areas ranging from film, music and stage to comics, journalism, video games, technology and food. Adler left Kickstarter in 2013. 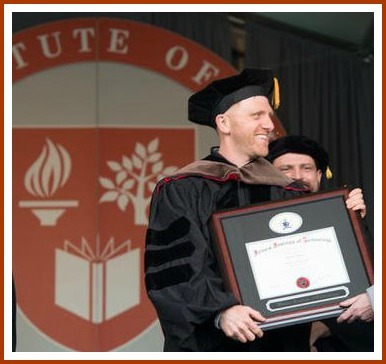 Five years later — still in his early 40s — he’s the recipient of an honorary degree from the Illinois Institute of Technology. Even more impressive is that this is his only college degree. That’s right: Adler is a college dropout. He left Purdue University — where he was studying mechanical engineering — to co-found Subsystence (an online music, photography, art, poetry and fiction site), and the design and technology studio Source ID. Then came Kickstarter — and Forbes’ designation of Adler as one of the 12 Most Disruptive Figures in Business. Since 2013, Adler created and developed Lost Arts, an interdisciplinary laboratory, workshop, atelier, incubator, school and playground occupying 25,000 square feet on Chicago’s Goose Island. Charles Adler, with his honorary degree. Growing up in Westport more than 25 years ago, Adler recalls, he was interested in architecture — and passionate about electronic music, punk rock, skateboarding and cycling. College was not right for him. He tried a second time — because he needed an undergrad degree before entering a graduate design program that interested him — but again he dropped out. So, parents of Westport students who may not be taking a traditional path during or after Staples: Don’t worry. Your kid too might one day earn an honorary degree, even if he or she lacks a college diploma. They just might need a kick start. This entry was posted in Education, Organizations, People, Staples HS, technology and tagged Charles Adler, Illinois Institute of Technology, Kickstarter, LostArts.co. Bookmark the permalink. Cool story. But do you know what it would take these days for a college student to get a job, actually even an internship at Merill-Lynch or an equivalent on Wall Street? At a minimum, a high GPA, demonstrated analytical Finance coursework, volunteer/extracurricular experience, top-tier SAT or GMAT scores, and a recommendation from a professor. Then you apply, are screened, and take an online assessment. Then, you might have the opportunity to go through the intense interview process from which only a few will get hired, for an internship. Being hired full-time is its own drawn out and competitive hunger games process. It’s a completely different world today. Impressive story. Gates and Zuckerberg also famously had more promising tracks to pursue than college. However, we all need to be careful about letting our kids draw too many conclusions from these rare cases. For most of them, the path away from college can become the course of least resistance leading somewhere way south of the Forbes’s List!